Bangsa Ria as a day-care centre for the disabled and mentally-challenged, was originally run by a church in Bangsar for some years. When the church decided to close down the centre in 2006, the children were literally left in the lurch. The staff too had no other place to go. The parents, despite having helped to raise funds had no recourse as the centre belonged to the church which had the legal right to close it down. Out of desperation, in the same year, parents and well-wishers came together and registered Persatuan Orang Kurang Upaya Bangsa Ria KL & Selangor (Bangsa Ria Association for the Disabled KL & Selangor) as a legal, registered society under the Registrar of Societies (registration no. 0873-06-SEL). Each child is different: some are autistic or display autistic behaviour. Others severely mentally challenged with various disabilities. One has Down’s. Each has their own timetable of training activities to best develop their skills. The less mentally disabled have activities ranging from picture puzzles, colouring to simple writing, maths, beading and fixing blocks (hand-eye coordination). For others, even scooping food on a spoon and placing the spoon into the mouth is a fantastic skill, as is indicating that they need to use the toilet. Each child has a time period in the Snoezelen Room which is a safe, fun, cool sensory stimulation area which even normal kids (and adults) love! We celebrate all the children’s birthdays and festivals. Many of our children may not be able to speak but they know, understand and respond to love, kindness, joy and genuine sincerity. Snoozelen Room (a place for sensory adventure and experience!) Our Snoozelen Room is a magical place of dazzling fibre optic cables, xylophone, vibrating bubbles tubes, music, moving pictures, soft cushions, carpets and a whole lot of things that promote sensory skills and allow the children to develop their senses of touch, smell, sight, taste and sound. In between training activities, there is time for playing on the swing, trampoline fun, a bath, lunch, snacks and a short rest. Almost every year, we organise a jumble sale at our premises. This sale has a 3-fold function. One, we raise funds. Two, we raise public awareness of our centre in the media. Three, we price most items at very low figures and sometimes give them away. As many customers come from the lower income bracket and some are foreign workers, this is our contribution to society in thanks for the many kindnesses shown to us. We also take part in the annual Austrian-German-Swiss (AGS) Christmas Bazaar selling items made by generous contributors. AGS too has become a very kind contributor to our centre. Apart from selling items made by others, we cannot do much as our children are too severely mentally disabled to make things on their own. Bangsa Ria collects a monthly contribution of RM400/- per child, who are provided with breakfast, lunch and tea. Our monthly outgoings total near to RM10,000/-. We need to emphasise here that only the staff are paid. The committee members receive no allowance whatsoever for their work whether administrative, travelling or any other expenses incurred. In fact, we often pay out of our own pockets even for treats for the children, stationery or postage. 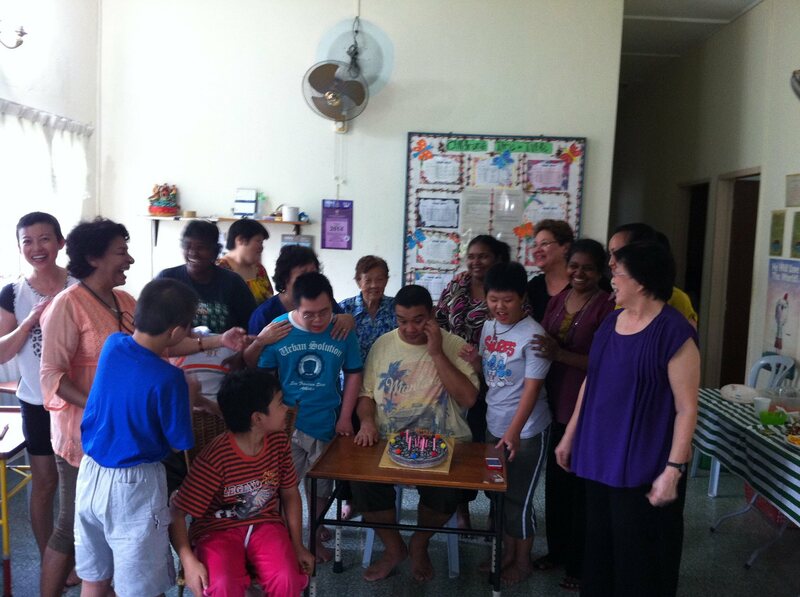 At Bangsa Ria, age is not a factor, nor religion, nor race. Our doors are open to all and we are strictly secular. We accept every disabled person who wants our help and we welcome every kind of help, in cash, kind and time. Please make all cheques payable to: Persatuan Orang Kurang Upaya Bangsa Ria KL Dan Selangor. Our Bangsa Ria children (they are all children in mind, though the oldest is 39) may not always be able to show their appreciation of your contributions. Rest assured, we, the staff and parents, will. Thank you for reaching out to our children. Thank you on behalf of Bangsa Ria. 1. To have a permanent place of our own. 2. A benefactor to cover our monthly excess expenditure. 3. A caring corporate foundation to take over the Centre, as eventually, parents would not be around to see to our children’s welfare. Bangsa Ria faces the problem of having to find a new premise in the near future as the owner of the present premise is asking for the property back. The Centre also have problems trying to get its Snoozelen Room equipment repaired. The room is a place of dazzling colors, sounds and images, built to stimulate the minds of the children, and to promote their sensory skills of touch, sight and sound.